Lemony Snicket’s A Series Of Unfortunate Events wasn’t the only franchise-starter orphaned during the young-adult gold rush of the 2000s. But it was, if you’ll forgive the Snicket-esque wordplay, the most unfortunate victim of that post-Harry Potter trend. The exaggeratedly morose misadventures of Violet, Klaus, and Sunny Baudelaire aren’t meant to be condensed into a single installment, the way they were in the 2004 Unfortunate Events film directed by Brad Silberling. The orphans’ search for answers about their parents, their parents’ untimely demise, and the fire that caused their parents’ untimely demise was an ongoing story. After all, the word “series” is prominently placed within the title, right after the indefinite article and the books’ pseudonymous scribe, a nom de plume of Basic Eight author and Magnetic Fields accordionist Daniel Handler. Thirteen years later (an appropriate number), A Series Of Unfortunate Events makes a smooth transition to Netflix, with help from Handler and executive producer Barry Sonnenfeld, both of whom were involved (and then not involved) with the movie version. To paraphrase the series’ own tongue-in-cheek metacritique of the cinema, “It’s so much more convenient to consume entertainment from the comfort of your own home”—and it’s so much more convenient to retell Handler’s epic tale of woe and whimsy when each novel gets two 42-minute episodes to set the mood, to steep in the wit, and to integrate the interjections of the tangent-prone Snicket (played here by Patrick Warburton). Turning a series of popular books into a TV series might not have been the obvious route in the ’00s, but in our Game Of Thrones era, it’s the smartest. A fairy tale for macabre bookworms who’ve graduated from Roald Dahl but aren’t ready for Edward Gorey, A Series Of Unfortunate Events follows the Baudelaires—14-year-old inventor Violet (Malina Weissman), 12-year-old bookworm Klaus (Louis Hynes), and virtuoso teether Sunny (Presley Smith)—as they bounce from ill-fated guardian to ill-fated guardian, barely one step ahead of murderous thespian Count Olaf (Neil Patrick Harris). Harris melts into the count’s thick prosthetics and ludicrous hairpieces, affecting the regal purr of a mad genius who doesn’t realize he’s a complete dolt. It’s a departure for the actor, though one grounded in the cavalcade of cads he’s played since blowing up his former-child-star persona in Harold And Kumar Go To White Castle. Lacking Barney Stinson’s charisma, Dr. Horrible’s vulnerability, and Doogie Howser’s cherubic countenance, Olaf gives Harris the chance to be outwardly, unequivocally dastardly, playing big, brassy notes of oversized evil befitting the song-and-dance man’s hammier tendencies. As the Baudelaires wander into the domain of Frank Underwood, Litchfield Penitentiary, and BoJack Horseman, it’s easy to forget that A Series Of Unfortunate Events is family entertainment. It treats mature themes like grief, loss, and disappointment with sardonic honesty, but that’s a world-weariness beyond the show’s reading level. As such, there’s a baseline broadness to this adaptation—best exemplified through the bumbling of Olaf’s accomplices—and a tendency toward the repetitive. In covering the events of the first two Snicket novels, A Series Of Unfortunate Events’ first four episodes rehash familiar beats in Scooby-Doo-like fashion: Olaf plots to relieve the Baudelaires of their inheritance, Violet and Klaus’ appeals to the nobler adults around them fall on deaf ears, the guardian of the week comes to an untimely demise, and the Baudelaires outsmart Olaf. (And he would’ve gotten away with it, if it weren’t for those meddling orphans.) Fortunately, the show breaks free of these rhythms with a late-season sojourn to a lumber mill; unfortunately, that’s after a few too many scenes of Weissman (who’s almost too mannered for this material) and Hynes (who’s just shy of mannered enough) talking through their latest dilemma. 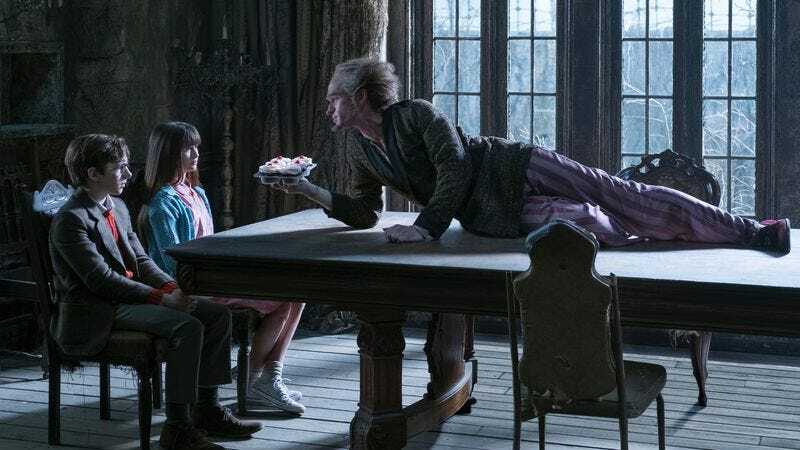 A Series Of Unfortunate Events argues that adults should listen to kids and take what they have to say seriously, but its most entertaining presences are almost uniformly old enough to drive. Following Harris’ lead, guest stars including Alfre Woodard, Aasif Mandvi, and Catherine O’Hara cut up in silly wigs and sillier fashions, relishing roles that demand theatricality (and theatrical deaths). Violet and Klaus’ urbane pursuits and careworn existence are contrasted by an adult world that’s endlessly frivolous, one of reptile scientists, secret societies, oversized cigars, and tilted houses teetering on seaside cliffs. This blend of tragedy and twee calls to mind the Sonnenfeld-produced Bryan Fuller dramedy Pushing Daisies, though its closest TV ancestor might actually be the Adam West Batman series: Kids stuff with adult sophistication, driven by two-part stories, outrageous visuals, and the scenery-chewing of big-name guest stars. Chief among those delights is Warburton’s portrayal of Lemony Snicket, the chronicler of Baudelaire misfortunes who, in time, reveals his personal connection to the story. 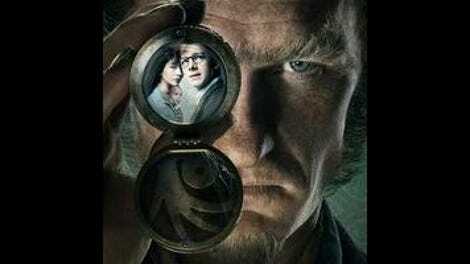 In a further improvement over 2004’s A Series Of Unfortunate Events, the Snicket of this version is not quite narrator yet not quite active participant, popping on and off screen (often in scenically appropriate wardrobe) to advance the story or tee up one of the series’ faux-illuminating asides. He’s a connection to the material’s literary roots in addition to a playful televisual device, and Warburton’s dry delivery is an ideal fit for the role. In perpetual deadpan, he underscores Snicket’s characteristic warnings that A Series Of Unfortunate Events will bring viewers only pain and misery, an in-joke echoed in an ever-mutating theme song sung by Harris. In the 2000s, Hollywood heeded that exhortation, closing the book on the Baudelaires. But in the time that’s passed, a better home for Handler’s story emerged, one that’s more accommodating of its style and quirks. How very fortunate.